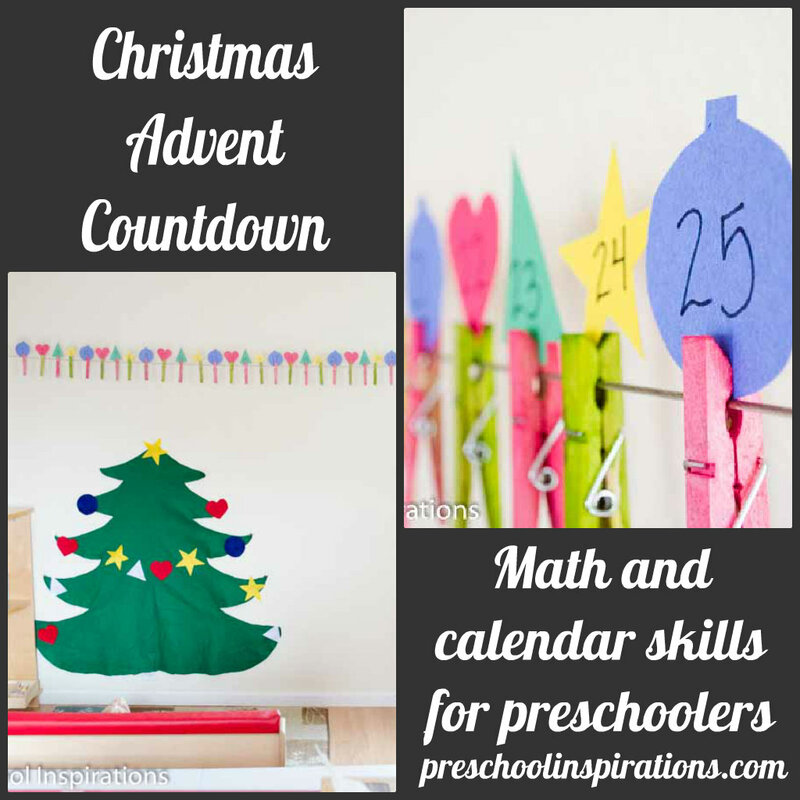 Make a simple Christmas Advent Countdown for preschoolers and toddlers. The countdown to Christmas has begun, which means that curious little minds are anxiously awaiting the number of days until Christmas. Christmas advent calendars are super fun and some are quite delicious if I might say so myself. I decided to go with one that I could turn into a DIY Christmas advent calendar though. Since my own 4-year-old daughter asked about ten times a day, for probably a week, how many more days until Christmas, I knew it had to be a clear visual. And we especially love countdown activities to help little ones help understand the concept of time. I created our Christmas advent countdown calendar that we hung in our classroom above our felt Christmas tree. 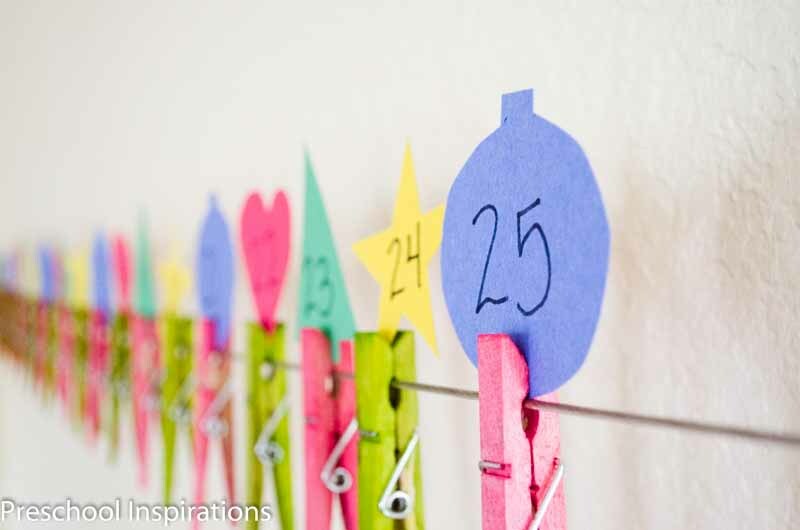 Each morning we take a clothespin away and count how many more days until Christmas. 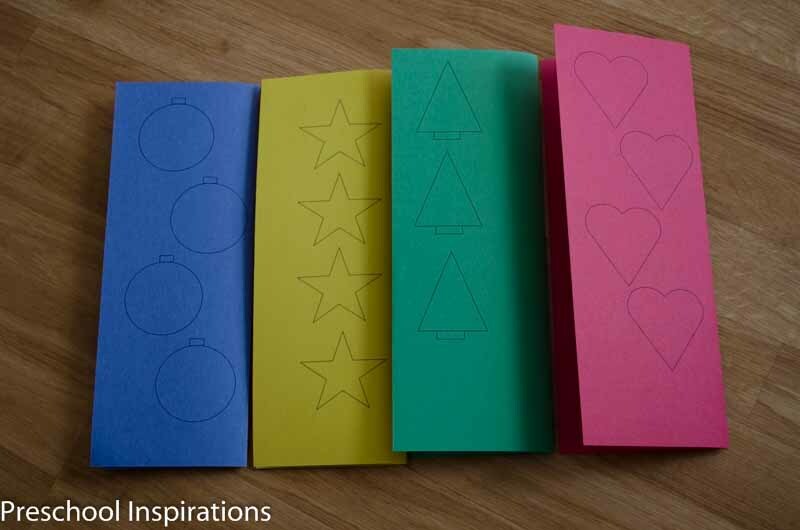 For any preschool teacher, this is a perfect calendar time activity for the month of December. The best part is that this really works! Sometimes I don’t give little ones quite enough credit for how brilliant they truly are! Since they are no longer asking how many days until Christmas, I am reassured that they are starting to understand the goal of this activity. 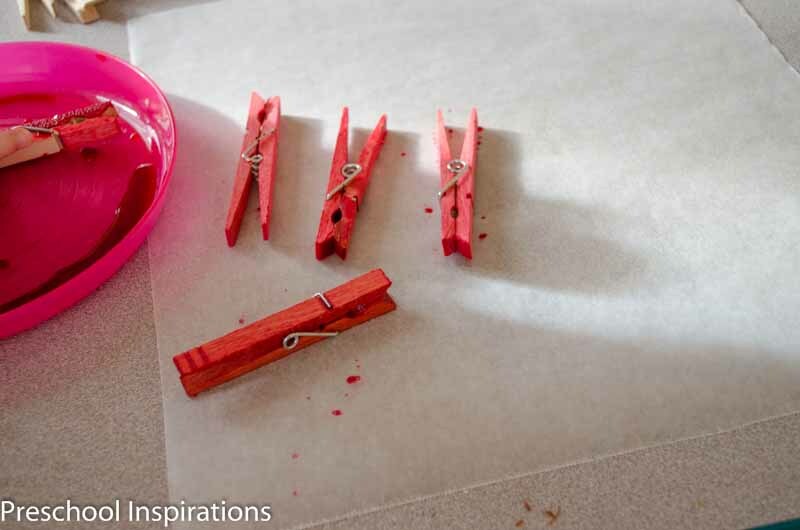 Dye clothespins (of course dying them is optional). Put the clothespins with the shapes on a hanging line. Feel free to make a pattern with the shapes. We got this particular art line at IKEA. Order them from left to right with however many days until the big day. Even if you are close to Christmas, this is still super fun! Although this is called a countdown, we are more accurately counting up to Christmas. I went ahead and made some printables of the shapes for anyone who would like to use them. Print them out, fold them, then cut. It’s much easier to cut four and get eight :). They are definitely not perfect, but I wanted to make something available to anyone in a hurry. 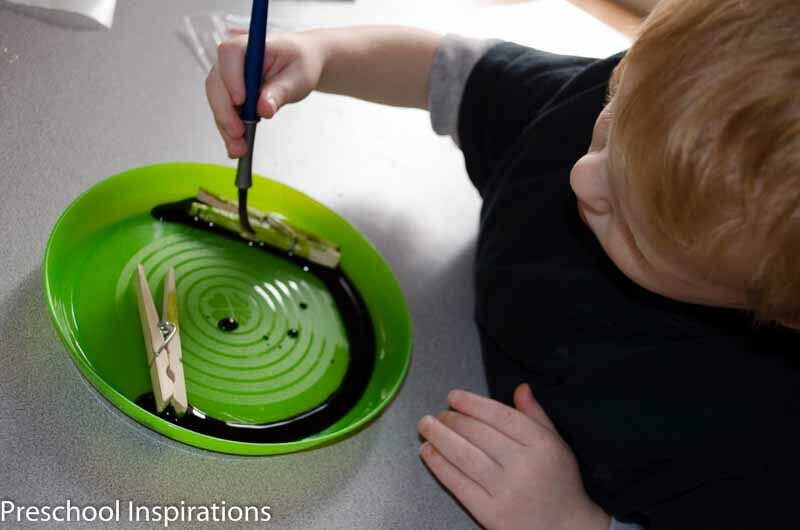 There are a lot of math skills coming from this activity: counting, learning about quantity, measurement, number recognition, shape recognition, learning about time, patterning, and even addition and subtraction skills for the more advanced preschoolers. Time is a very hard concept for preschoolers to grasp. It is abstract to them, so in order to help them comprehend it, we need to make it more tangible. I really never thought I would say that time is “tangible” because it isn’t, which is why it makes this so tricky. In this case a tangible model is represented by clothespins. We talk about the patterns as well. The patterns of the clothespins is one that they all are great at. The printables can be used for any sort of pattern, so you don’t have to use all four shapes. Instead you could follow a format such as AABB, ABC, ABBA, etc. Mine is actually a bit complex, so I will probably change it up next year. Sugar and Spice (my daughter) and Lil’ Red (my son) dyed all these clothespins. I got the idea of dying them from Fun at Home with Kids. We pulled out our liquid watercolor and paint brushes, and they got to work. I don’t actually have green liquid watercolor, so we mixed it with the blue and yellow. I honestly only keep red, blue, and yellow liquid watercolor around since I know I can make any other color fairly easily. One day I will probably buy more, but that’s my frugal solution for now :). If you enjoyed this post, feel free to share follow along on my facebook page. What a really good idea – we painted loads of pegs before to do a colour match game so could use them. Thank you for sharing. Thanks Pinkoddy! How perfect that you already have some lying around! A color match game sounds awesome. We’ll have to try that and dye some more colors! What a fun countdown idea! Love the big tree!! It’s a pleasure to have you hop over, Beth! 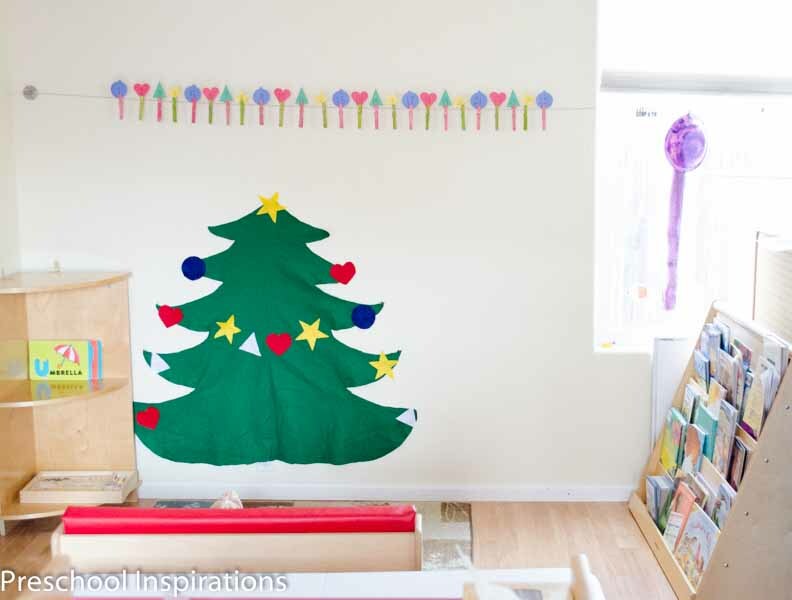 We love the big felt Christmas tree too — they are so much fun. I love this! So doable and all about the counting rather than getting something each day! Thanks katepickle! I also love that we are not getting something new each day — there is already waaaay too much stuff around here at least :). I like how you dye the clothespins, and how frugal you are. So maybe you’ll like this tip: You get much better purple and orange if you use magenta rather than red. To get red, add just a drop or two of yellow to the magenta, just like in a color ink cartridge in a color printer. That is absolutely brilliant, Michelle. And I do have a LOT of magenta around actually. Thanks so much for the great tip!